Department of Social Welfare and Development (DSWD) Secretary Rolando Bautista (far right) listens to the reports of agency representatives of the National Disaster Risk Reduction and Management Council (NDRRMC), DSWD Field Offices (FOs) II and Cordillera Administrative Region (CAR) and concerned provincial and local government units (LGUs) during their strategic meeting in Cauayan, Isabela. 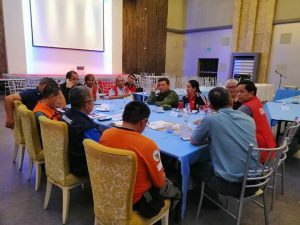 The Department of Social Welfare and Development (DSWD) together with other members of the disaster response cluster, specifically the Office of Civil Defense (OCD), the Department of the Interior and Local Government (DILG), Philippine Army (PA), Philippine Air Force (PAF), and concerned provincial and local government units (LGUs), held a strategic planning meeting to discuss strategies to reach isolated areas affected by Typhoon ‘Rosita’ in Regions II and the Cordillera Administrative Region (CAR). Yesterday, DSWD Secretary Rolando Bautista was joined by DSWD-FO II Director Leonardo Reynoso and DSWD FO-CAR Director Janet Armas to present updates on the latest disaster response operations and initial damage assessments in the two affected regions during the response cluster meeting held in Cauayan, Isabela. “One of the isolated areas that we are targeting to reach is Natonin, Mountain Province and we are consistently coordinating with other cluster members for logistics support to deliver relief assistance to the area,” said Sec. Bautista. As of 12 noon today, a total of P6,113,299.95 worth of assistance has been provided to the families affected by Typhoon Rosita, of which, P 4,848,560.75 worth of aid came from the DSWD, P1,253,139.20 from LGUs, and P11,600 were extended by non-government organizations (NGOs) and other groups. The DSWD-Disaster Response and Management Bureau (DRMB) also reported that as of press time, displaced families have already returned home and only 247 families or 840 individuals are staying in 21 evacuation centers in Regions II, VIII, and CAR. All evacuation centers in Regions I and III have been closed. DSWD-Field Offices I and III will now proceed to early recovery phase.